We are currently rebuilding the website for a fresh new look. It may appear a bit jumbled and wonky for a bit but please be patient as I am a very small company with just me and my father trying to keep up with work and the site. We are adding content and upgrading the site daily. Thank you. Owning a home is no easy task. Just keeping up on the maintenance that a home requires can seem like a full time job. Throw in an unexpected pipe breaking or electrical socket that stops working and you can become overwhelmed. Let us here at 5 Star Handyman service take some of the burden off of your shoulders. When you hire 5Star Handyman Service you are guaranteed a few things. We guarantee that the job will be done in a professional manner, meaning the task will be done when we said it will be done, how we said it will be done, and at a very competitive price. Our handyman team has the skills and experience of a seasoned general contractor but the mobility of a handyman. That means we can take on smaller jobs that you may not be comfortable taking on or just don’t have the time to tackle and still keep the price low. 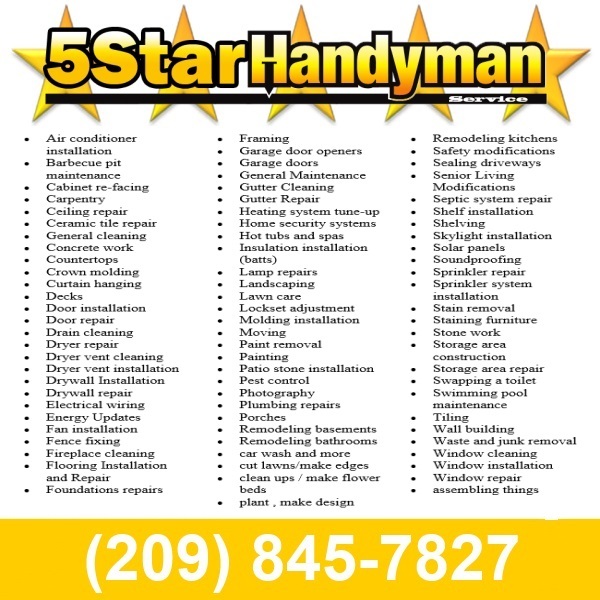 Why Use 5Star Handyman Service in and Around Modesto ? Our business depends on repeat business from satisfied customers so we try and keep our rates very reasonable. We charge the same for all our services, unlike many who will have higher rates for electrical and plumbing repairs done in Modesto, and a different rate for drywall repair. If your skilled as a Handyman this is unnecessary. We have set prices in place for specific jobs, such as appliance replacement that are common to the handyman trade. We find this works best for us and our customers in Modesto and surrounding areas. We also will give a discount if more than one of these services is required in the same trip. Dishwasher removal and replacement is $85.00 to $100.00 with under sink plumbing changes. If you don't already have the appliance you need replaced we can pick up your new appliances if purchased local and haul away your old units. Standard ceiling fan replacement or installation are $70.00, if all existing wiring and ceiling boxes are sufficient. High, vaulted ceiling installs are $100.00. We can install almost anywhere you want, with or without existing electrical but there will be an additional charge and material costs are the customer’s responsibility. 5Star Handyman Service is a professional handyman service based in Modesto Ca. We are reliable and trustworthy. Time to update that old bathroom? We specialize in Vanity replacement, cabinet restoration or replacement and flooring installation, tile, wood or Lino. Time for a new mirror, sink or bathroom faucet? Are you falling through your bathroom floor, give us a call today before it's too late to save it. There's no Plumbing problem we can't fix; from small repairs like leaking faucets, shower heads, leaking toilets or complete tub and shower replacement. Our interior and exterior painting is performed with quality from the first steps of preparing the surfaces all the way through completion. If you're thinking about saving money on your paint job by using cheap paint, you're going to spend more money on the application process. Cheap paint is harder to apply and takes several coats to achieve a decent finish; whereas quality painting products are easier to apply and produce a beautiful finish. Use cheap paint and you'll be repainting again in no time at all. Our electrical experience includes the replacement of kitchen appliances, ceiling fans and lights, electrical plugs and light switches. In addition we have the experience to install new lights and electric plugs anywhere in the home. We are experienced at troubleshooting your electrical shorts and system overloads that are causing your breakers to shut off. Our handyman services are performed quickly with quality as our main focus. Anyone can throw paint on a wall or patch drywall; but only a professional can do it right the first time. 5Star has been called in many times to fix what other handyman services have destroyed. We don't track mud across your floors, we don't drip paint on your new carpet, we don't leave behind dust on your Television and furniture, and we most certainly never cut corners to save time. We guarantee our work.